Karen and I are ranch dip fans going way back to Friday night sleepovers during junior and senior high, when ranch dressing on tortilla chips was our snack of choice. I’ve haven’t eaten a lot of ranch dressing or dip in the past several years because I just got a little tired of the taste. 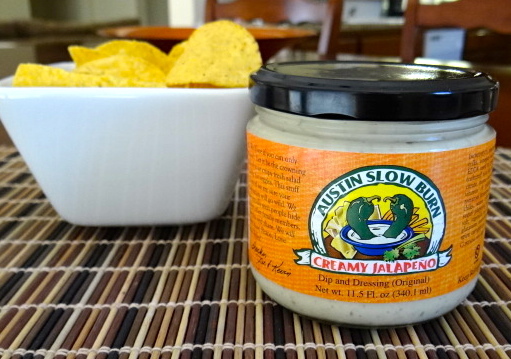 That all changed when I brought Austin Slow Burn Creamy Jalapeno Dip and Dressing home from Central Market. This ranch dip has a tastebud popping blend of spices and jalapeños that blew me away. The “slow burn” was evident, with the initial creamy ranch flavor slowly igniting into a tasty jalapeño burn with lots of interesting flavor notes in between. It was love at first bite, but it didn’t stop there. I literally could not stay away from the jar. I started feeling a little guilty about my tortilla chip intake, so I switched to eating my new addiction as a salad dressing. Talk about waking up a plate of greens! I added sliced grilled chicken breast with maybe just a few more tortilla chips, crushed, on top of the greens, and it was a restaurant-worthy salad. The bottom of the jar came way before I was ready. Kevin and Jill Lewis are the masters behind the magic of this delicious dip and dressing. As former restaurateurs, they were experts on chile peppers, and started their journey to the gourmet food business by gifting friends and family with Salsa con Habanero made from their home garden bounty. As demand grew, the couple decided their products were commercially appealing and in 1994, they launched Austin Slow Burn. The company now offers a variety of salsas, jams, jellies, marinades and a very interesting product named “Fire Dust’d P-nut But’r”. All of the products are award-winners. I’m not going too far out on a limb by declaring right now that Austin Slow Burn Creamy Jalapeno Dip and Dressing is going to be one of my favorite foods of the year, probably forever. It is amazing stuff!